Written by Daryl Dela Cruz, a guest contributor to Vancity Buzz. He is an advocate for SkyTrain extension in Surrey and is the leader of the SkyTrain For Surrey: Better Surrey Rapid Transit group. He also writes his own blog at Daryl’s Take And More. Vancouverites enjoy a fast, grade-separated rail rapid transit service with some of the most frequent peak-hour service plans in the world – a train running every 108 seconds, in both directions, on our main line: the Expo Line. Reality Check – Why is SkyTrain breaking down so frequently? Even cities such as Tokyo, although they usually operate bigger trains, have found difficulty in planning rail transit services that match SkyTrain in terms of its frequency. As hard it is to believe, given what has happened twice in less than a week, we also enjoy a service that is actually on-time most of the time (with stats showing that only 5 per cent of service is not on time, and 95 per cent of service is). We enjoy it so much that I think that we have developed an collective expectation that things will always work out the way they’re supposed to. On Thursday, a major issue with the computer system plagued SkyTrain services right through the peak of the afternoon rush hour, causing delays that extended into the evening. Then it happened again on Monday when a major issue just after noon struck the SkyTrain system again, this time shutting down the public announcement system for trains and platform which effectively prevented passengers from getting vital information on the shutdown. But there is now a heightened public concern over the state of the region’s metro rail system with fears and anger that this could be a systemic issue. Some people have questioned the viability of our system technology, which is entirely automated (computer driven) and does not require any train drivers. Surrey Mayor Dianne Watts even took it as an opportunity to promote her municipality’s light rail vision, as if it would be a system with less problems (in reality, it is a whole different set of problems). Vancouver, you’re not the only one with issues – and you actually have it much better. The TTC subway in Toronto has faced issues plaguing portions of the subway system. The most recent happened just a few months ago when a portion of the busy Yonge­-University­-Spadina Line was closed due to “communication errors” (sound familiar?) and power issues, requiring operators to launch a shuttle bus service along the disrupted section for over 2 hours. Other instances have also required full shutdowns of the system like what was seen on the SkyTrain on Monday afternoon. It also turns out that no less than three weeks ago Portland experienced a “system meltdown” on its ground-based, light rail rapid transit system. @pdxcommute MAX operator at Sunset TC just told everyone there’s no power to the rails downtown all eastbound trains are backed up. The Portland MAX (Metropolitian Area eXpress) system operates somewhat differently from our own SkyTrain. Trains are manually driven and are not fully-grade separated from intersections and the street. It does not run on computers, meaning it is permanently exempt from issues such as the one that clobbered SkyTrain Thursday evening. But that does not mean that the MAX does not have issues on its own. During the incident several weeks ago, there was an issue with the overhead wiring system that supplies trains with electricity. A power issue caused all overhead lines across the entire MAX and downtown streetcar system to shutdown. Without electricity, the system froze to a halt from the start of the morning rush hour and right past noon. For seven hours, from 6:30 a.m. to at least 2 p.m., service was disrupted and had to be canceled across the system. Like the incidents in Vancouver, riders in Portland were faced with significant delays as they had to disembark from their trains and wait for alternate shuttle buses (bus bridges). Both cities have limited spare buses and drivers and must resort to cancelling scheduled services on existing bus routes. July 2: “Police activity” blocks track and closes MAX LRT, requiring shuttle bus service. July 15: Problem trains on the system. TriMet was reporting delays of up to 30 minutes on Twitter (although many riders reported delays that exceeded an hour), during the PM rush. July 16: Collision between train and garbage truck disrupts passengers during the morning rush hour. 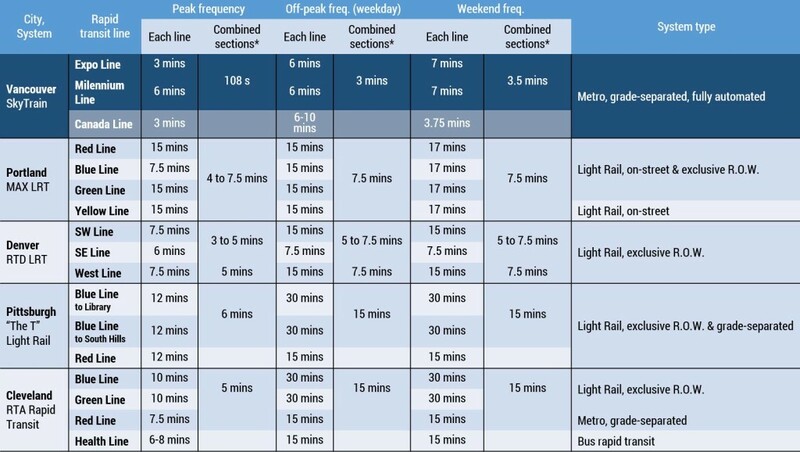 This is a breakdown of the on-time performance numbers for various light rail transit (LRT), subway and other rapid transit rail systems across North America. Such high frequencies are not possible on light rail systems without high costs due to the need of labour to manually drive each train. Our SkyTrain Expo and Millennium Line service has an on-time reliability of 94.7 per cent – it ranks highly in this list. Meanwhile, Portland’s numbers show that disruptions on the system happen often, with an average on-time rate of 82 per cent – not much higher than TriMet’s bus network. While Toronto’s numbers suggest a good reliability, this is measured to a lower standard that appears to not account for trains that may arrive ahead of schedule. Fully-grade separated metro systems, in addition to automation control, like SkyTrain tend to be more reliable whereas light rail systems typically face more issues and have far lower reliability rates, especially along spans where there are ground level street crossings. The two light rail systems at the very bottom of the list have extensive segments that are mixed within regular traffic and do not have full transit priority. They are about as reliable (or unreliable) than traditional buses. On the other hand, light rail systems with separated rights-of-way, such as Seattle’s Link Light Rail, have higher reliability rates than those with at-grade and/or on-street portions which is unfortunately what is proposed for Surrey. Seattle’s Link is largely elevated or underground. The worst system on the list is San Francisco’s Muni Metro light rail system as it consists of extensive on-street portions. On this system, trains are not frequent and arrive late almost half the time. SkyTrain’s automation control enables high frequency train schedules running as frequent as 108 seconds during peak hours between Waterfront and Columbia Stations. Vancouver handily outperforms these other medium­ sized cities in providing more frequent, faster rapid transit service to the population. None of these cities’ systems matches SkyTrain’s level of service at any time during the service week. No other transit system in a similarly sized North American metropolitan area is as extensively built as Vancouver’s. There is also no other transit system in a mid-sized city within the continent that even justifies the same high level of service that Vancouverites enjoy with SkyTrain. 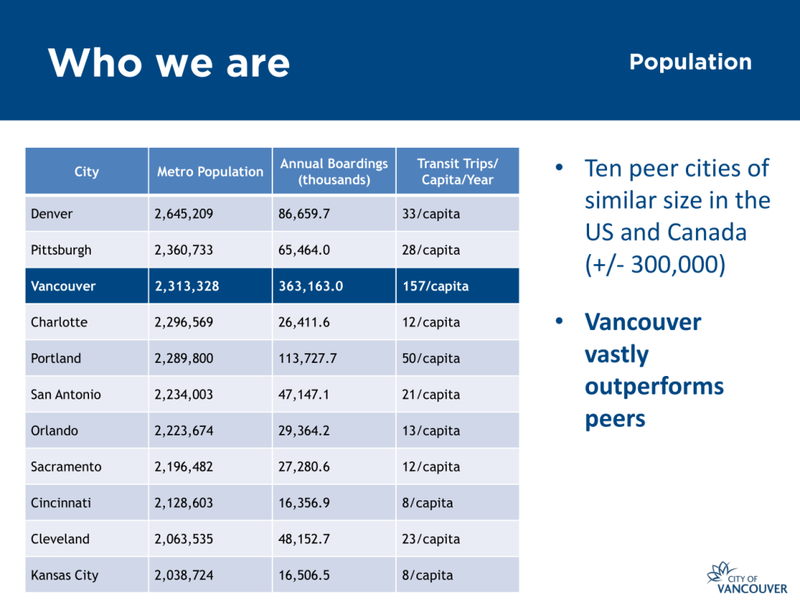 Metro Vancouver’s ridership levels per capita rank third in North America, just behind New York City and Toronto and ahead of Montreal, Washington and other larger cities with much larger metro systems. There is no doubt that Metro Vancouver’s rail rapid transit is unique, but it is for the better. In 1986, our leaders chose SkyTrain technology while the rest of the continent pursued to build with conventional light rail technology. This has had phenomenal, unique effects that were first seen here before they were experienced anywhere else in North America. With our system, we do not see the same small, periodic issues that cities with light rail systems must tolerate. So, when SkyTrain does flip the bucket, it does so in a way that might be a large inconvenience to its customers. However, SkyTrain is not in this state for a lot of the time at all. Our SkyTrain system deserves some appreciation for being up, running, and reliable as always by the next day. Remember – it could be way worse.